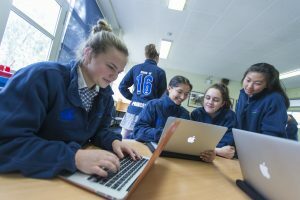 Students are expected to bring in one device only (laptop, notebook, netbook tablet/iPad) to use during their studies at Melbourne Girls’ College. The device is then connected to the wireless network. Please note, we do not connect phones to the wireless network. MGC has no prejudicial requirements for make or model of the student device, we allow Windows, Apple or Android devices. The College technicians will provide assistance in connecting to the wireless system and printers. Any faults with the privately owned hardware or software need to be referred to the place of purchase. Students bring their devices to school at their own risk, and the school will not be responsible for any loss or damage incurred at any time. Students are required to bring fully charged devices to the school. There are no charging facilities for student computers. Finally, MGC Computer Services are happy to provide advice but only take questions via email. Please contact the Network Manager of MGC, Anthony Keen on anthony.keen@mgc.vic.edu.au for any questions regarding IT @ MGC.